How do you know you’re in a restaurant that’s great for gluten free? I think it’s when you tell the server you are coeliac, she smiles and says “Amazing!”, whisks away your menu and brings another, super-easy to read colour coded one. This was my greeting at Dishoom: the new Bombay cafe on St Andrew Square in Edinburgh. Having said that, the actual first thing that hits you about Dishoom as you walk through the door before you meet the fabulous staff, is the most amazing smell of spices! There are good gluten free choices here, clearly marked on the special menu and brought to your table with a stick marked “allergy” in each dish you can eat. Given the tapas style approach – lots of gobsmackingly tasty dishes to share – this is not awkward, but actually makes sharing do-able, which it isn’t usually possible for we coeliac / gluten intolerant types. The food comes out sometimes all at the same time, and sometimes in different stages. So you just order what you want and along it comes, looking and tasting divine. With a previous recommendation to try the signature House Black Daal, we made this central to our choices. The griddled meats and fish come with no sauce, but lots of tasty marinade. A Sheekh Kabab of lamb with lime coriander and cumin, had a little pot of cucumber, onion and tomato on the side, plus piles of fresh leaves. 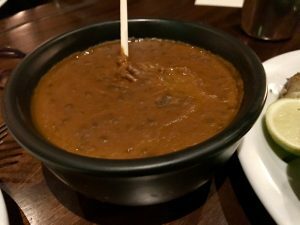 The black daal gives everything a bit of a kick and adds some sauce, so is a good combo with steamed rice and those great, succulent kebabs. A tiny pot of mint and coriander added a little more oomph to it too, but the flavour of the lamb came through and it was moist. Further dishes of note included the most tasty Gunpowder Potatoes, a sort of seeded potato salad with raita on the side – very delicious and I know the potato fiends in my family would love it. 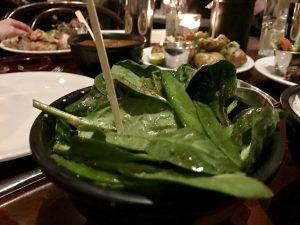 Also in our choice was a Bowl of Greens – a super spicy and seriously fresh tumble of broccoli, mange tout and spinach, plus my gluten-eating friend enjoyed a great looking chicken dish: Murgh Malai. Dishoom also offers a RANGE of gluten free puddings and some good options for an apparently fantastic breakfast. We were a bit full by pudding time, so sadly I didn’t feel up to testing them – a good reason to go back! You can book for breakfast – unlike dinner where it is pot-luck to get a table (so apologies for my WordPress automated “Book Now” message!). 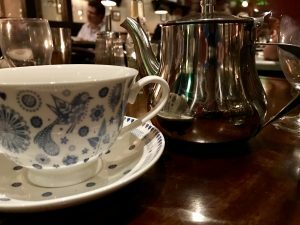 Though waiting is no issue as there is a wonderful, bustling bar where you wait for your table and the whole building is just a great experience. This is a good new addition to the Edinburgh restaurant scene and so different to the usual curry experience. I should point out that there is an automatic service charge of 12.5% added to your bill, but it is worth every penny! The service was so friendly, smiley and professional. Our server, Amy, simply made our evening super special and for me, really easy and enjoyable. Her “amazing” welcome when the coeliac bit came up, was so different to so many places – I felt immediately at home! Apologies for the long review, but Dishoom is worth it. Go and enjoy a good choice of GF, some of the tastiest food I have had in a long time and some of the best service I have seen in Edinburgh in quite a while. A new favourite is born!